What information do we collect and process about persons that are under 16? What information you may choose to share? Mattel163 is a member in good standing of ESRB’s Privacy Certified Program. To protect your privacy, we have voluntarily undertaken this privacy initiative. The ESRB has reviewed our website (www.letsplayuno.com) and the UNO! mobile app, and certified they meet established online information collection, use, and disclosure practices. As a licensee of this privacy program, we are subject to audits of the website and UNO! mobile app and other enforcement and accountability mechanisms administered independently by the ESRB. We want you and your family to have fun using our Services, and urge you and your family to follow common sense whenever disclosing personal information - in our Services or anywhere else. If you have any comments, questions or complaints regarding the processing of your personal information, you can contact us at privacy@mattel163.com. oWhen you register for any one of the Services, including to set up your profile, you provide us with information about yourself. This includes your email address, gender, age, username, character name, password, and other information that help us confirm your access to your account. You may register utilizing a third-party account, such Facebook, Apple Game Center or Google Play, in which case you will provide us your username (or “Social ID”). As part of promotional activities for the Services, you may submit your contact details to us (including your name, email address and physical address). When you make purchases in the Services, you provide us with information to facilitate the payment. We automatically collect certain data when you use the Services, including your IP address and device information, such as device type, network data, operating system (hereto referred as “OS”), IP address, device ID, and AD ID, language, and time zone. We also automatically collect information regarding how you use the Services, such as date and time stamps of actions and Game Data, which includes your game level, progress, scores, achievements, game log and interactions with other users. Some of this information will be stored on your device so we can remember it the next time you come back. We automatically collect information about your general location (i.e., country), which is based on your IP address. In addition, we will collect information about your precise location, but only when you provide affirmative, opt-in consent within the Services (for example, if you choose to search for nearby friends to play a game). We have a record feature that gives you the option of recording your in-game performance and interactions through a video. You may choose whether or not to use this feature. Your mobile device might ask you for access to the “Gallery” as storage location. We do not collect or access any photos or videos stored on your device. We also collect and store your data each time you interact with us, for example, when you use in-app support to communicate with us. We also collect your voice data after you consent to use your microphone. When you sign in to our Services with a social media account, such as Facebook, Google Play, or Apple Game Center, we will collect information from your third party account, including your user ID, nickname, profile picture, and/or friend list with your prior consent. We only use the data received from these platforms for use with our Services. We also collect information on your use of the Services via Cookies and related technologies (e.g., third-party SDKs). Additional information about our use of these technologies is provided below. We take many special precautions to protect the privacy of children. In general, we define “children” as users under 13, but adhere to local definitions of “children” where a different age of consent applies, such as children under the age of 16 in the European Economic Area. Children must not use the Service for any purpose without the consent of their parent or legal guardian. We do not collect any personal information from children unless, as described further below, the information is required to play the free UNO! game. This is why certain functionalities, like entering a username or email address, sharing results with social platforms or purchasing credits are deactivated for children. We also do not track the behavior of children. This child-friendly version of the UNO! game is called “Quick Start”. Children users will be directed automatically to this version. 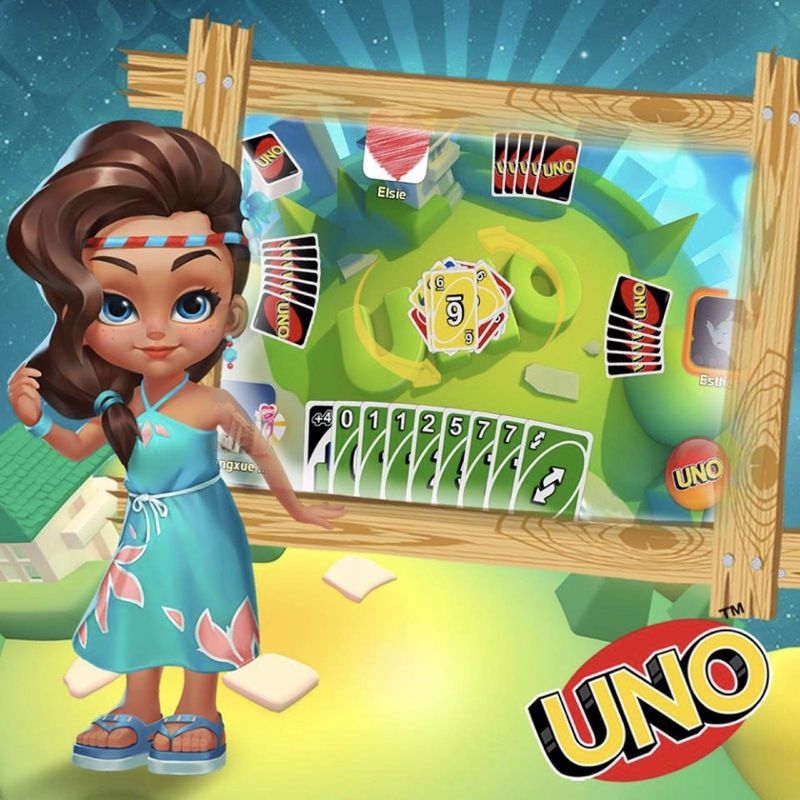 In our Services intended for children, consisting of the Uno! Application and website, we do not ask for personal contact information (like full name, e-mail address, phone number, or home address) from children without the consent of a parent or legal guardian, except in limited circumstances authorized by law. We collect some information (like IP address, mobile device unique device identifier (hereto referred as “Device ID”), OS, etc.) automatically and use technology like cookies exclusively to provide functionality and support the internal operations of our Services. We do not use these technologies to track user behavior or amass profiles of children. We use personal information from children located in the EEA exclusively to perform our contract with the child to provide the Services. We take steps to prevent children from posting or publicly disclosing personal contact information. Parents can contact us if they have any questions about the collection, use or sharing of their children’s information. If we collect an email address from a child in connection with a customer support inquiry, we delete the child’s email address immediately upon responding to the child’s request. If you are a parent that has provided consent to the collection of your child’s personal information, you have the option to consent to the collection and use of your child’s personal information without consenting to our disclosure of that information to third parties. Parents also have the right to review or have deleted their children’s personal information, and to refuse further collection or use of their children’s information. To exercise those rights, parents may contact us at privacy@mattel163.com. Registration Information: We use Registration Information to set up user accounts, allow users to log-in to the Services and provide Services to users. We use this information pursuant to our contract with you to provide the Services and, with regard to information received from social networks, with your consent. Device Information: We use this information to provide and improve the Services such as: to allow users to download and install the Services on their devices; to enable user voice chat with each other; to record and keep track of requests from users of the Services; to detect the user network and device status when the user is using the Services; and to correct bugs or errors that occur when the user is using the Services. Use of Device Information is necessary to perform our contract with you to provide the Services. Contact Information: From time to time, we may host marketing events and/or user testing for which we will request this information so that we can send you notifications of any rewards to which you are entitled or coordinate playtest logistics. We use this information with your consent. General Location Information: We use country-level location information to provide some Location Based Services such as providing our Services in the appropriate language. We use this information to perform our contract with you to provide the Services. We use more precise location information to provide Services for which you provide affirmative consent, such as to form a team with people nearby to play a game. Social ID: We use this information to enable users to share their game achievement or game-play video on social media or invite their friends to the Services. We use this information with your consent. User Profile: We use this information to provide customized services to users such as a personal information page. We use this information with your consent by uploading your name and/or photo. For the protection of your information, we recommend you do not use your real name and personal photo in our Services. Game Data: We use this information to provide the Services to our users. Use of Game Data is necessary to perform our contract with you to provide the Services. Information Generated from Cookies and Tracking Technologies: Our Services use technologies, like cookies and web beacons, to manage registrations or access to certain features, store your settings and preferences, conduct age-screening, offer you personalized content, help us understand the features that appeal to visitors, and manage advertising, among other things. If you want to know more about the cookies and third parties (i.e., SDK or advertisement providers) we use to collect your personal information for marketing and analyzing, including additional information on the third parties’ privacy policies and opt-out options, please click <here> for more details. You may also check the relevant sections “Your rights” and “Promotional Material & Announcements” for more opt-out information. You have the option of sharing your personal information with the public or with third parties. For example: (1) sharing gameplay video, screen shots or game achievements with third-party platforms or the public through a “share” button on your game system; (2) displaying your real name or photograph within games; and (3) sharing personal information with others through chat, text, or communications features. If you choose to "share" content or to otherwise post information from or via our Services to a third-party platform, that information (which may include your and other users’ personal information, like username and profile photo) will become public and the third party platforms may have access to information about you and your use of our Services. Likewise, other users may use these same features to share information about you. For the protection of your information, we recommend you do not use your real name and personal photo in our Service. We are not responsible for how you choose to share personal data with the public or third parties, or how third parties use the feature to share information. To perform our contract with you, your personal information will be accessible from and will be processed on our servers, which are located in the United States. We may share the information we collect with our corporate affiliates for internal support, such as helping us to make our Services more available and functional, and providing technical, customer, billing, administrative, event planning, marketing or operational assistance to us. PlayFab,Inc., which processes game data, IP addresses and conducts in-game behavior analysis for the purpose of internal hosting and maintaining the Services. Unity Technologies, which processes IP addresses, mobile advertising identifiers (e.g., iOS IDFAs, Android advertising IDs and Google advertising ID) for personalized ads. You may choose to opt-out via Apple or Google Ads Settings website link to discontinue the personalized function. You may change your privacy settings to opt-out of ad tracking on your device. related group companies, with whom we share your personal information to the extent necessary to operate the Services. The transfers contemplated above are made pursuant to our contract with you. protect the rights, property or safety of us, our users, a third party or the public as required or permitted by law (including exchanging information with other companies and organizations for the purposes of fraud protection). Some of the recipients of your Personal Data listed above are located in countries outside the EU/EEA that do not offer the same level of protection with regard to Personal Data as required in the EU/EEA and where there is no adequacy decision by the European Commission. In that case we will ensure an adequate level of data protection by appropriate safeguards, e.g. EU Model Clauses, Privacy Shield or BCR certification. If you would like to obtain a copy of the safeguard that we use, please contact us at the contact details indicated below. Unfortunately, the transmission of information via the internet is not completely secure. Although we will do our best to protect your personal information, we cannot guarantee the security of the information transmitted to our services. If we learn that your unencrypted personal information has been compromised by a data breach, we will notify you consistent with applicable laws. As a general rule, we retain your personal information only as long as required to perform the Services or other purpose that was the reason for the collection of the information. We will retain most of your personal information as long as you use the Services (i.e., until account deletion in accordance with your request) with the following exceptions: Audio voice files will be stored for up to 24 hours after you use it in the game, and then deleted from our servers. Contact Information that is obtained as a result of you participating in our promotional activities will be retained during such activities as expressly designated in the corresponding activities. Game-play video recordings will be uploaded to our servers and deleted within one month from the date of their creation. When destroying personal information, measures will be taken to make the personal information irrecoverable or irreproducible, and electronic files which contain personal information will be deleted permanently using a technical method which makes the files irreproducible. In the event that the processing and retention period have terminated, but personal information is required to be retained continuously for other reasons including for archiving purposes as prescribed under applicable laws, the relevant personal information will be stored and maintained separately from other types of personal information. If you require us to destroy your personal information before the end of its life cycle (as set out in the retention policy above), we will destroy your personal information in accordance with local laws). You have certain rights in relation to the personal information we hold about you. Some of these only apply in certain circumstances (as set out in more detail below) and as provided under EU data protection laws. To exercise any of your rights, please contact us at privacy@mattel163.com. You have the right to access personal information we hold about you, how we use it, and who we share it with. To assert this right, please contact us as described above. You have the right to receive a copy of certain personal information that you have provided to us and that we process about you. This comprises any personal information we process on the basis of your consent (e.g., gender information) or pursuant to our contract with you (e.g., game play statistics), as described in the section “How We Use Your Personal Information”. You have the right to receive this information in a structured, commonly used and machine-readable format. You also have the right to request that we transfer that personal information to another party. You have the right to correct any personal information held about you that is inaccurate. To assert your right, please contact us as described above. You can delete your account, or remove certain personal information. If there is any other personal information you believe we process that you would like us to erase, please contact us as described above. You can also exercise your right to restrict our processing of your personal information (as described below) while we consider your request. We may need to retain personal information if there are valid grounds under data protection laws for us to do so (e.g., for the defense of legal claims or freedom of expression) but we will let you know if that is the case. Where you have requested that we erase personal information that has been made available publicly on the Services and there are grounds for erasure, we will use reasonable steps to try to tell others that are displaying the personal information or providing links to the personal information to erase it too. you would like to verify whether our legitimate grounds for processing the information override your interests. You have the right to object to our processing of personal information about you, which you may do by contacting us as described above. You may be able to alter settings on your browser, device, or other software to block or partially block those third parties. Sometimes those settings may not be effective. This section applies to users age 16 or older and adult users. You have the right to ask us not to process your personal data for email or text promotional purposes. We will inform you and obtain your consent (before collecting your data) if we intend to use your data to send promotional text messages or emails, or if we intend to disclose your information to any third party for such purposes. You can exercise your right to prevent such processing by checking certain boxes on the forms we use to collect your data. You can also exercise the right at any time by contacting us at privacy@mattel163.com. You are able to opt out of receiving targeted ads and analytics on our Services by limiting ad tracking in your device settings. Please note that you will still see ads, although they may be less relevant to you. For ads in Apps, You can opt out of interest-based advertising on mobile applications by resetting the privacy settings of your Android or iOS device and selecting "limit ad tracking" (Apple iOS) or "opt-out of interest based ads" (Android). Some web browsers may transmit “do not track” signals. Web browsers may incorporate or activate these features differently, making it unclear if users have consciously activated them. As a result, at this time, we do not take steps to respond to such signals. For ads on the website, you can manage your cookie preferences using your own browser settings (for example, Chrome, Edge, Internet Explorer, Firefox, Safari, or Opera) to accept or block some or all cookies or receive notice so you can consent to cookies. In addition, some of third parties who provide tailored ads and analytic services are members of the Networking Advertising Initiative (“NAI”) and/or the Digital Advertising Alliance (“DAA”). If you wish to not have your information used for the purpose of serving you targeted ads, you may opt-out by visiting https://www.aboutads.info/choices and/or https://www.networkadvertising.org/choices/. If we make any material changes to this policy, we will post the updated policy here and notify our users within the Services. Please check this page frequently to see any updates or changes to this policy.